Where is the last place on Earth you’d expect a super pale, super sunburn prone girl like me to go? If you guessed a desert with no shade you’d be wrong. If you guessed the Caribbean, you’d be dead right. And not just any Caribbean island either, nope, I went to the islands of Trinidad and Tobago. Want to see how it went? Check out my blog below (hint: there’s a ton of delicious food involved!). 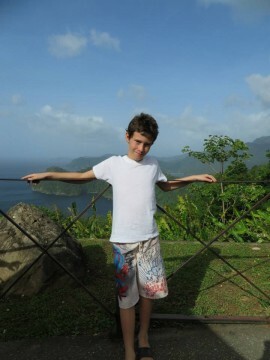 I’m sure you’ve heard of the islands of Trinidad and Tobago, but do you know anything about them? Here’s a quick lesson: two islands at the bottom of the chain of Caribbean islands just eight miles off the coast of Venezuela (and thus popular for drug smugglers to stop at), rich in oil and natural resources, previously colonies of Britain, France, the Netherlands, Portugal and Britain again, with a population of mostly Indians, descendants of former African slaves brought over to work the sugar and cocoa plantations, some Chinese and a smattering of white people thrown in for good measure. Mix it all together and you’ve got T&T. 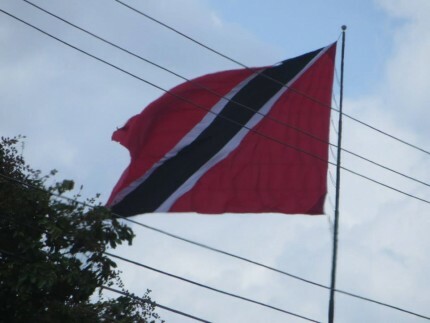 It resembles the international sign for scuba diving, but it’s actually the official flag of Trinidad and Tobago. Writing this originally, I’d been back in the States for just under two weeks, yet my first trip to Trinidad already seemed like it was ages ago. If it weren’t for the mosquito bites still visible on every inch of skin unlucky enough to be uncovered during the trip, you might never realize it had been so recent. Ever since I met my amazing boyfriend Sean, he’s been telling me tales of growing up in Trinidad, and it sounded wonderful; like some place I definitely needed to see for myself. When the opportunity presented itself last summer (and he was feeling guilty for waiting almost three years between visits home), we jumped on it. Less than a month after the plane tickets were bought, I was touching down in a new country with a unique perspective on life; or at least a perspective very atypical to the American view. How is it atypical, you ask? Trinidad is much more relaxed and unhurried (in regards to most things) than anywhere I’d ever been before. A perfect example of this was Customs and Immigration in the airport. Although there were twelve booths for immigration, only five were being manned at the time that our flight (and approximately three other flights) arrived; one of the booths even had two women standing and chatting not checking any passports for the whole hour we waited to get through. This was my first real indicator I wasn’t in America anymore. 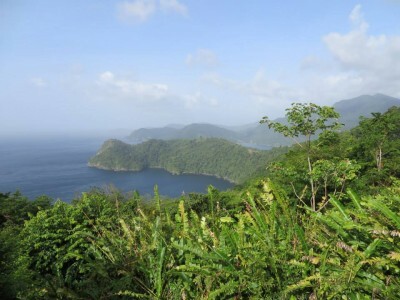 One of the many beautiful shots of Trinidad’s coastline. Fantastic. 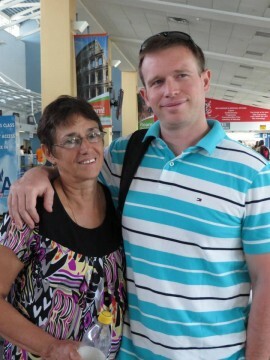 Sean’s mom, Suzette. One of the sweetest ladies around. Sean’s nephew, Ethan. Cutie pie. As soon as we exited Customs, blew through Duty Free to pick up alcohol (just as essential as bread or milk) and walked out of the airport, Sean’s mom, Suzette and nephew, Ethan were there to greet us enthusiastically. 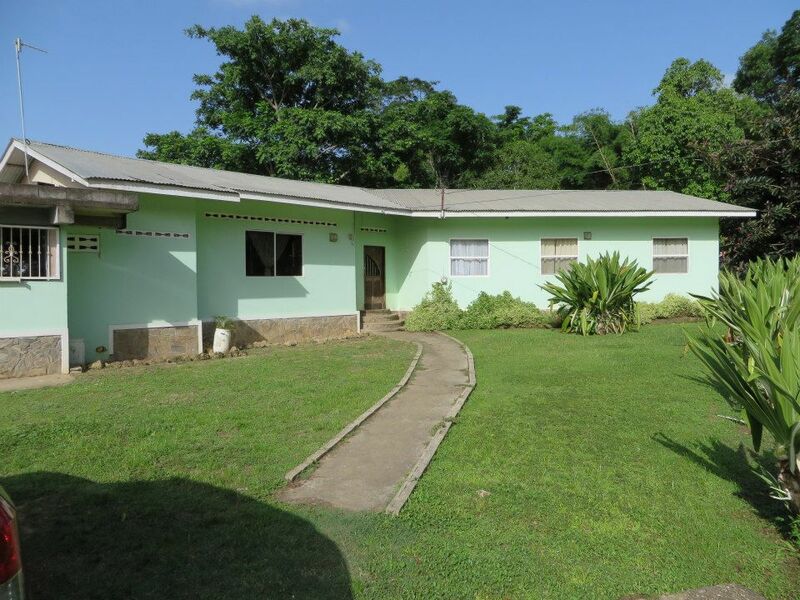 It was the warmest welcome you could imagine and in no time we were on our way to “The Bush” — his family’s nickname for their home nestled in the middle of a cocoa plantation in the central mountain range of Trinidad. Approximately one hour after arriving in Trinidad, the Food Tour de Force began and didn’t end till we departed nine days later. For the sake of time and space, let me begin to list out what we ate during our stay with clarifications for many of the foods sadly foreign to the majority of the US. Digression #2. Their home in the Bush. Here we go: roti (an unleavened bread-like a wrap usually filled with curries or cooked vegetables), buss up shut (another type of roti bread where two pieces are baked together layered like pastry), dhal puri (Indian flatbread stuffed with seasoned filling of ground split peas – noticing a pattern yet? ), stew chicken (chicken flavored with lots of spice, browned and simmered in a large iron pot, commonly served over rice), macaroni pie (a baked macaroni and cheese dish even better than what’s served in the US), bok choy, mangoes, doubles (street food sandwiches made of two pieces of flat fried bread and filled with a mixture of curried chick peas, topped with pepper sauce or tamarind sauce), tamarind balls (tamarind fruit rolled into candy balls with a blend of sugar and spice), curry duck, coconut bake (a thick bread made with coconut), hops bread (light fluffy rolls), Crix (crackers), pastelles (steamed cornmeal pies wrapped in banana leaves and filled with stewed meat, olives and raisins – amazing! ), shrimp dumpling soup, cutters (bar food appetizers: e.g. wontons, roast pork, etc. ), bake and shark (deep-fried shark stuffed in a fried bread), pelau (a one-pot stew of seared meat, rice and beans), pow (steamed buns filled with a savory pork filling similar to the bbq pork buns served with dim sum), char siu kai fan (a form of barbecued pork not served in US Chinese restaurants, but it should be), coconut turnovers (buns with sweetened coconut in the center), lemon buns (like hot cross buns), meat pies and chicken puffs, Kiss Cakes (Trinidad’s answer to Hostess), fried plantains, currants roll (flaky pastry covered with currants and cinnamon sugar then rolled up and baked – so delicious), and on most everything pepper sauce. Honestly, it makes me a little embarrassed now to see the length of this list, but in a new country for the first time, known for its cooking and hospitality, what else could I do? Say no? I think not!!! So with that list out of the way, I’ll actually continue the story in the next blog! I know: whomp, whomp. But hey, more great stuff to come. Don’t miss it! This entry was posted in Caribbean, North America and tagged Caribbean, Food, North America, Pepper sauce, T&T, Tobago, Travels, Trinidad, Trinidad and Tobago on June 6, 2014 by Paige N..